Sungold tomatoes. Image from BonniePlants.com. 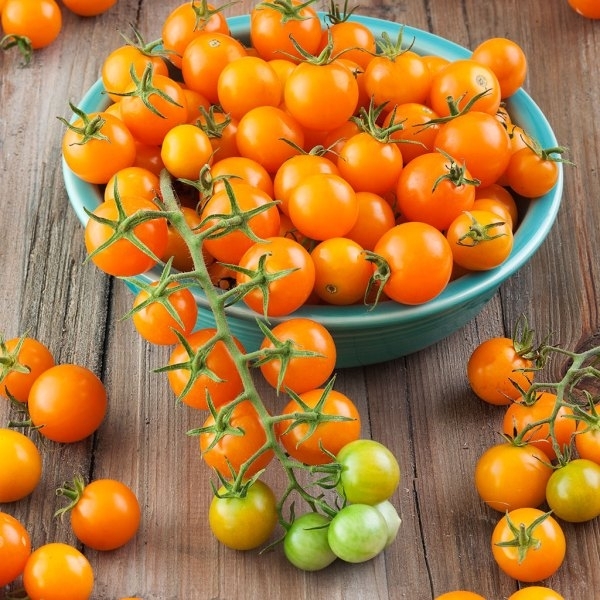 Have you eaten Sungold tomatoes? They are a cherry tomato with golden yellow 1” fruits that taste like summer bliss. Although it's a little late in the season, if you can find a Sungold tomato start, please buy one, plant it, and be prepared to share your bounty with all your neighbors. I have some neighbors that ask about my Sungolds every time I share any other tomato variety with them! (Hint: as of this morning Annie's Annuals had Sungold seedlings available for mail order). Sungolds are an F1 hybrid, meaning it has two different tomato plant varieties for parents where one variety is pollinated by the other variety's pollen. You can buy seeds for Sungold tomatoes but if you save seeds from your Sungold cherry tomatoes and plant them next year, they may not grow up to resemble or taste like a Sungold. One reason Sungolds are so yummy is that they have high sugar content. One website that sells the seeds and starts says they have “explosively sweet flavor.” They mature in 55 to 65 days and the plant can grow up to 10 ft tall. 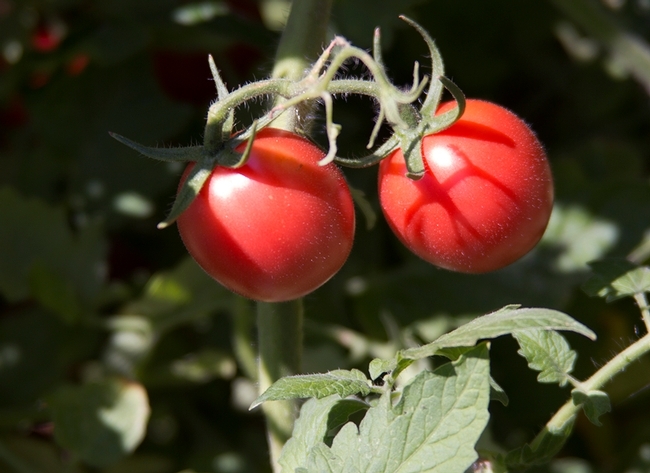 Because they are indeterminate producers, they will continue to produce tomatoes which ripen throughout the growing period. According to Bonnie Plants they are resistant to Verticillium wilt (V), fusarium (F), and tobacco mosaic virus (TMV). Click here if you'd like to learn more about tomato pests and how to manage them. Once you have your Sungold cherry tomatoes, make a tomato salad! Don't forget to subscribe to our blog so that you receive an email notification when a new post goes up. If you have questions, contact us online, by phone or in person to get answers to your gardening quandaries! Jazmin Lopez wrote this post for us a year ago but a visit to a big box store yesterday as well as some online shopping reminded me that it's time for a reminder! As much as we all want to plant them, it's a bit too early for tomatoes just yet. 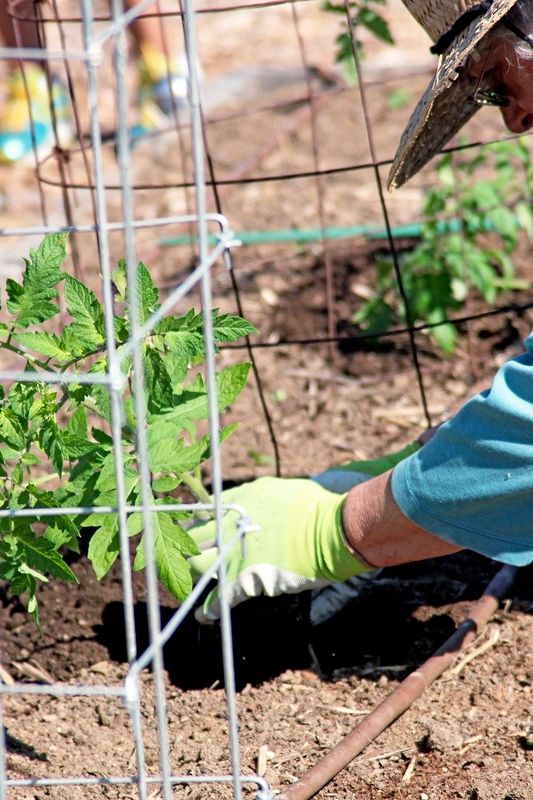 A Master Gardener plants tomatoes. In May! Spring is finally upon us and the weather has been absolutely gorgeous. All this sunshine & spring showers have me thinking about my vegetable garden. I already have some seeds in the ground, but I want to keep planting more. The other day while strolling through the local garden center my eyes happened upon some beautiful tomato and pepper transplants. I watched as my hands started loading them into the shopping cart, I could already taste the fresh summer salsa they would be making their grand appearance in. Then it dawned on me, it's only March! We are getting to the end of the month, but it's still too early. Yes the days have been warmer, but remember seasonal temperatures are very important in determining when to plant a crop. You'll have more success with your garden if you wait for the right time to plant. Average monthly temperatures for cool-season crops during their growing period: 60-65F. This includes, carrots, parsnips, spinach, lettuce, broccoli, and garlic to name a few. Average monthly temperatures for warm season crops during their growing period: 65-80F. This includes melons, corn, eggplant, peppers, squash, and tomatoes. Also remember when planting your seeds to plant them at a depth of twice the diameter of the seed and to thin the emerged plants according to the directions on the seed packet. Or if you are planting transplants, make sure to space them accordingly. The following table is a wonderful reference for recommended planting dates and planting requirements such as distance between plants in rows. For our area (Monterey, Santa Cruz, & San Benito Counties) you'll want to look at the “North and North Coast” column: Vegetable Gardening at a Glance: How to Plant and Store. So if you're wondering what I ended up doing with those tomato and pepper transplants at the garden center, I put them right back where they were. I'm going to resist my planting urges until May so that I'll have healthier plants and a more bountiful harvest. Source: California Master Gardener Handbook, Home Vegetable Gardening, Pages 342-352. University of California. 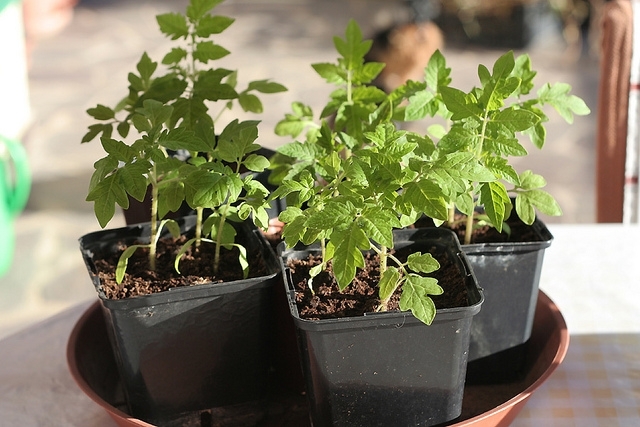 The photo “Cherry tomato plants” is (c) 2012 by Rowena and made available under a CreativeCommons Attribution-NonCommercial-NoDerivatives 4.0 International License.